If there is any indicator the sixth-generation Chevrolet Camaro has far surpassed its classic designation as a pony car, the 2017 Chevrolet Camaro ZL1 underscores it. The Camaro team is on a mission to expand the vehicle’s depth and breadth to new audiences, and produce variants that should have the Germans shaking in their boots. Accompanying this newfound school of thought, we have no problem calling the sixth-generation Camaro a sports car. Because it is one, through and through. Pony cars of yore ditched refinement for straight-line speed, but nowhere is that rebuked more than in the 2017 Camaro ZL1’s cockpit. This is the first time we’ve seen a Camaro reach into the color palette in different places, as the Camaro team graces the 2017 Camaro ZL1 with red seatbelts. Sure, it seems minuscule on the surface, but everyone knows colored seatbelts mean business, associated with high-performance. It’s also a breath of fresh air from the fifth-generation Camaro’s interior cabin, which was decidedly blasé, lacking contrast and color, and encompassing occupants with a sea of gray. Along with the red seatbelts, red, color-contrast stitching is present in the standard Recaro seats, and the dashboard. 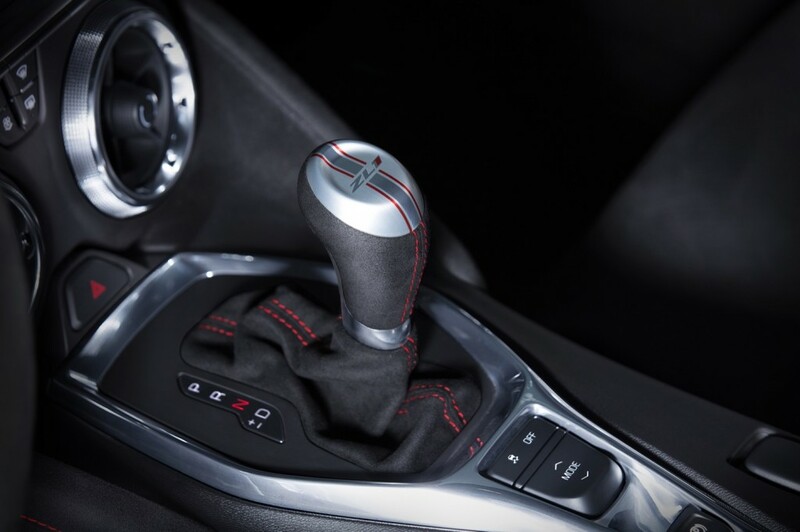 The 10-speed automatic and six-speed manual gear selector also see splashes of red to keep with the performance red theme. More so than ever does the Camaro encompass the whole, entire package. It’s capable, it’s fast and it’s starting to really feel special. Not typical for your blue-collar, bowtie badged vehicle. But, hey, we can get used to this kind of attention. This new ZL1 looks very good! Yes this is awesome, hopefully the pricing is not to bad. definitely ordering one. hopefully don’t have to sell my second child..lol. we only have one. so excited! never bought a sports car so this will be the first. fell in love with the Camaros a few years back but never pulled the trigger, glad I waited. If this is gonna be your first sports car…I highly recommend leaving traction and stability control ON. Thanks. Love to see it can’t wait hopefully the price is not crazy.